The Leader of North Kesteven District Council’s Conservative group has hinted that she may be ready to take a back seat - but only when there is a four year plan in place for the council. Long-serving Councillor Marion Brighton has been leader of the group on the council for many years and throughout the time that the Conservative group has controlled the council. In an exclusive interview with The Standard’s Andy Hubbert after her party’s victory at the local elections last Friday, she talked about plans for the future regeneration of Sleaford, employment and business opportunities and how she may step back from the leadership role in a few months time if that is what the party group want. 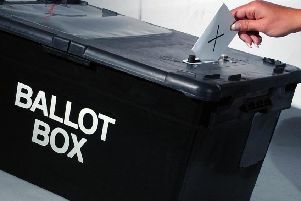 * Elsewhere, last Thursday also saw parish and town council elections for some wards. There were elections in Castle Ward and Holdingham Ward. The results were - Castle: Paul Coyne, Lincs Ind 436 (elected); Keith Dolby, Ind 617 (elected); Mark Graves, Ind 471 (elected), Brian Oliver, Ind 322. Westholme: Steve Clegg, Lincs Ind 562 (elected); Steve Fields, Lincs Ind 661 (elected); Graham Kelly, Ind 185; Heather Lorimer, Ind 362 (elected). Holdingham: John Charlesworth, Ind; Ken Fernandes, Ind; Grenville Jackson, Lincs Ind. Mareham: Jan Mathieseon, Lincs Ind; Adrian Snookes, Lincs Ind; Mark Suffield, Lincs Ind. Navigation: Paul McCallum, Lincs Ind; David Suiter, Ind. Quarrington: Bozena Allan, Ind; Mark Allan, Lincs Ind; Garry Titmus, Cons.